Disclosure: I received Looking For Lovely: Collecting The Moments That Matter by Annie F. Downs. Given complimentary from B&H Publishing, Provided I give an honest review. My Review: I felt like I understood a lot of the insecurities and situations that this author has gone through. She shares experiences of her life where there were ups and downs and basically points out where she found her lovely. 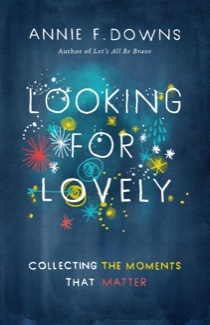 She describes where and how to look for those lovely areas and times in your life. Even in the worst experiences you have had in your life. I found it interesting how she could do this, but I know it's still really hard for me to find the lovely in my darkest moments. Sometimes I can't understand why God has allowed certain things I have went through to happen. I may never figure it out until I get to heaven. But we just have to try to stick with God and learn to trust and have faith in him. I am sure there is always a reason why someone has gone through this event or that event. Be it for them to grow from or to share with others so they are not alone. But yes there are a lot of areas that are difficult to understand. I found reading this book, okay. It was interesting learning about situations of life Downs experienced. I am sure this book has spoken to other people whom have read it, but it just didn't really speak to me. I didn't get that "aha" moment that I expected I was going to get. Other than that it is a very pretty cover and I do believe that there is a study guide you can buy to go along with it. Maybe I will do that later on and reread it with the study guide. Click this LINK if you want to purchase this book. Have a Blessed Day!